When all is said and done, what Curse of Fenric comes down to is trying to stop a coming apocalypse. And it was also close an apocalypse in terms of the production behind the scenes. 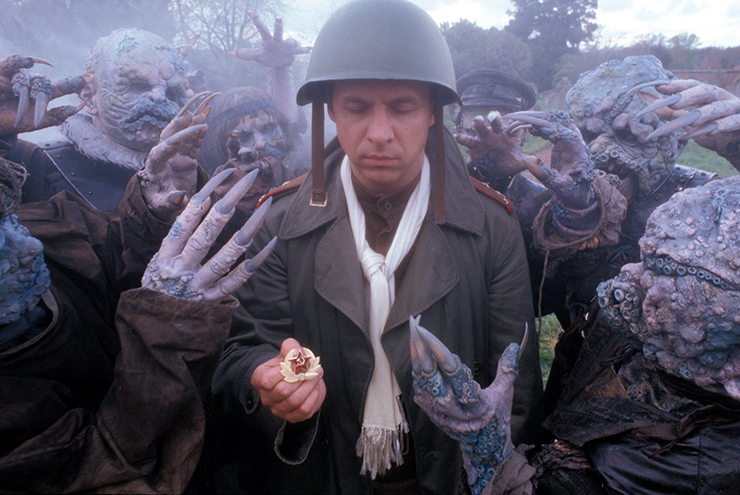 Curse of Fenric was the second-to-last story to be aired before the cancellation in 1989 and it begins to show us why that was the wrong decision. While it isn't a stellar story, it is better than most of the late 1980s stories and a definite improvement over the series 22/23 mess that showed us the producers were once again moving in the right direction. Curse of Fenric also allows us to see Doctor Who's second greatest talent in reinventing itself, which isn't just driven by a change in the lead actor but also in the production team actually thinking about things. In this case, it all down to the show's final script-editor, Andrew Cartmell. 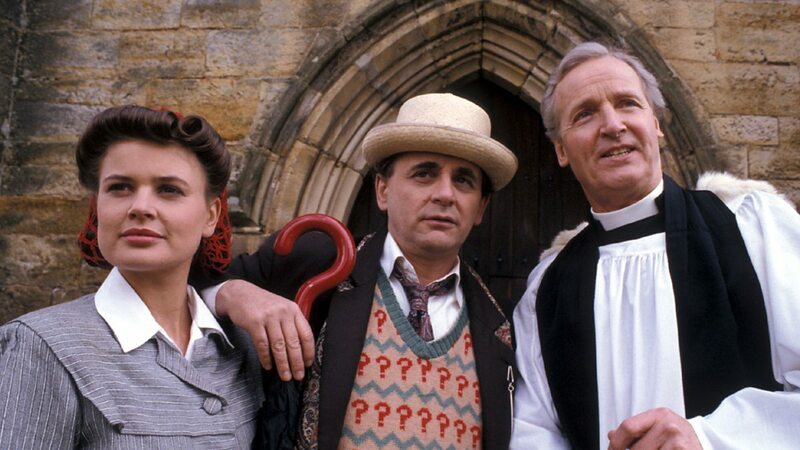 Cartmell and Sylvester McCoy had both come to the show at a time when it was in the air, the whole production had descended into a mess and it had resulted in Colin Baker getting fired. While their first series wasn't much of an improvement but both McCoy and Cartmell pushed for things to get changed and by the end of his third season, things have changed and improved dramatically, playing down the foolery that had been a staple during McCoy's first season. By the time the Seventh Doctor's era had come to an end, he had become a wise and mysterious father-figure to his companion Ace, played by Sophie Aldred. The dynamic between the two is something that had rarely been done before and rarely done since. It had been done between the Fourth Doctor and Leela and it was most apparent in The Talons of Weng-Chiang, but the type of character-development that Ace got was virtually non-existent for other companions. Even terrific companions like Jo Grant and Sarah Jane came onto the scene as developed as they were going to get. Even though Turlough started out as an assassin and then a travelling companion, he eventually fell into the typical companion archetype. Its just a shame then that the show got the axe just when it was getting really good again. While it would never again reach the same heights as it had during the seventies, it was making a great job of aspiring to it. However, without the strength that show went out on at the end of this series, it is hard to see how the BBC would have even considered bringing it back in the early 2000s. However, the McCoy years are much more influential on the modern series than some critics are willing to admit. We've got a companion who is pushed into the limelight, characters who play their parts over a long running story arc spanning many different episodes and storylines and a Doctor who is darker and more mysterious than his predecessors and has much more of an idea about what is happening than he initially lets on. With all that waffle out of the way, lets get on with exploring Curse of Fenric. The story starts of on a strong note and has some great opening moments, but what lets it down is that it gets quite convoluted and confusing towards the end. It also hasn't aged too well and to modern eyes, comes across looking quite cheap and cheesy. What is great however is that it dares to take the boundaries and limitations of the show and stretches them, even if it was too-little-too-late for the show when it would cancelled a few months after this story's initial broadcast. For a long time, it had seemed like the Doctor's travels had been random, with the TARDIS seemingly dropping them off at strange and wonderful locations to fight evil. However, Curse of Fenric and the proceeding story Ghost Light, the Doctor seems to be taking Ace to places from her past. In the case of this story, he forces her to face her feelings about her family, taking her to the army base in WW2 where he grandmother worked, having recently given birth to Ace's mother. Also involved in the plot is some early things about computing with the strange Enigma Machine operated by the wheel-chair bound Dr. Judson, very clearly based on real-life Alan Turing. 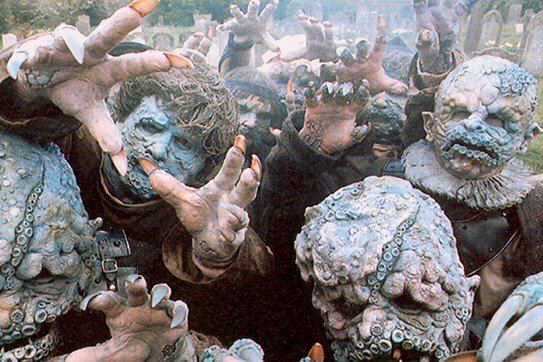 And as well as the WW2 intrigue, we've got Viking secrets, genocidal world politics, chess, an eerie villain, rebellious teenage girls and because this is Doctor Who monsters in the form of the gruesome Haemovores. The Haemovores are a bunch of underwater Vampires who have a convoluted time-travel back-story involving Dracula and they are the potential future evolution for the human-race. There are also a lot more unrelated material but one does feel that author, Ian Briggs set up too many targets to hit and the plot-line with Ace is the one that suffers the much. Captain Sorin holds the Haemovores back with his faith. In many ways, Ace's story does feel like the same one Leela got where the Doctor was trying to turn her into a nice member of society. And The Curse of Fenric very quickly goes into her backstory: In Perivale there once lived a little girl who was fascinated by explosives. Ace somehow managed to create a time-storm in her bedroom and ends up trapped on a planet in the far future where she has to work as a waitress. At the end of Dragonfire, the Doctor promises to take her home, albeit through the scenic route. That trip takes the course of two-seasons and along the way, we get to watch Ace growing up. The Curse of Fenric does give her several strong character moments, performed perfectly by Sophie Aldred. One of my favourite moments from this episode is the one where she refuses to go into the water with her new friends because the Doctor told her not too and she simply refers to swimming as stupid. And there is something fantastic about the way that Aldred delivers that one line, showing that Ace is someone who is finally growing up, turning her back on her adolescent years and becoming an adult, not giving into peer pressure. She also gets a much more adult moment later on when she has to seduce a guard to rescue a Russian prisoner who can help her and the Doctor. Nowadays the scene comes away as a little laughable but back then it was as risky and hypersexual as Captain Jack in many a Torchwood scene! It is certainly a strange moment, mainly because it plays out like a vampire seduction but the lines she gets shows us that she has become detached from her life on Earth. If I had been the soldier, I'd have asked what the hell she was on, but it is great that this seems to make the soldier even more fascinated by her and he even asks her to tell him more. Now, I don't by it as an attempt at sexual seduction, but what is interesting is that Ace manages to get through to him much as the Doctor does to other people, as a traveller of the cosmos. Looking at its bad side though, The Curse of Fenric is bogged down by some rather clunky dialogue and some rather special, special-effects that land the whole thing on the wrong side of cheesy and would otherwise spoil a really great moment. The glowing Viking runes look fake and some of the rainy scenes have obviously been aided by a hose pipe just out of the sight of the camera. And the teenage vampires are about as scary as trick-or-treaters. But I don't mind the ending to episode three where Judson is struck down and gets back up again, eyes glowing green and his demeanour has completely changed. The moment is slightly ruined though by the Bond-villain-like line, "We play the contest again, Time Lord!" The concept behind Fenric is also a little disappointing with the Doctor having been defeating evil gods since very early on in the show's history. Fenric does pale in comparison to someone like Sutekh from 1975's Pyramids of Mars, who managed to be compelling and terrifying though he was confined to a chair. But he had great dialogue and a great voice from the scary Gabrielle Woolf. And while Sutekh was clearly there to add to the Egyptian motif of the story but Fenric was all over the place iconography wise. Given how the story had a Viking background, and Fenric refers to his pawns as his 'Wolves', we're clearly meant to think this story is about Norse mythology. One does wonder then where the need to play a cosmic game of chess comes into play, or the fact that Fenric is an evil which predates history as we know it. None of it gels together. The creature Fenric is clearly based on the Fenris-Wolf, but that was believed to live in the icy-wastelands and bite people's hands off, miles away from something that the Doctor was supposed to have met in a desert wasteland and couldn't make the final move against in a game of chess. And since the creators can't seem to understand what the villain is actually about, The Curse of Fenric actually spins its wheels quite a bit. The Haemovores are just as confounding. Being creatures who are underwater Vampires who have been capturing and converting humans for centuries luring them away from ships and coastlines, it does actually work as a rather interesting take on the traditional Vampire mythology. There is also a nice inversion on the idea that a cross can hold them back when it is actually the faith of the person holding an object. This is something that leads to several of the best scenes in the story, particularly the death of Reverend Wainwright, who finds out that holding onto faith in god doesn't mean his soul has any more faith in humanity and there is a Russian soldier who puts his faith in the hammer and sickle symbol of Communism. Had the production team stopped there, then the Haemovores would have made terrific monsters, even with the convoluted baggage of their backstories. Even so, they are easily the most memorable monsters of the 1980s standing alongside creatures like The Mara. But Briggs then goes and gives the Haemovores a story about how they are the remnants of the Human race in the future who have been brought back in time thanks to the machinations of Fenric who is currently controlling them. This adds nothing to the story and just makes the audience have to suspend their disbelief a little more than should be proper.